HELPFUL HINT: Make sure you are seeing the newest version of this web page and the new stories - Press either the CTRL or the SHIFT key on your keyboard at the same time you mouse-click on the REFRESH/RELOAD button on your browser. That will force a refresh of the most current version of this page. April 23: Sublette BOCES Special Meeting - Sublette BOCES will have a Special Meeting on Tuesday, April 23, 2019 at 6:30 pm in the Conference Room, 665 N Tyler Ave. in Pinedale, Wyoming. The purpose of the meeting is to elect a new treasurer. April 24: Wyoming Game & Fish Soda Lake Renovation Public Meeting in Pinedale - To discuss potential renovations to existing wetlands at the Soda Lake Wildlife Habitat Management Area five miles north of Pinedale. The meeting is on Wednesday from 6-8PM at the Game & Fish office in Pinedale. April 25: SAFV Annual Spring Luncheon - 11:45 - 1PM in the Lovatt Room of the Pinedale Library. Guest speakers talking about the history of violence against women movement in the United States. Talk: "The History of the Violence Against Women Movement: Past, Present & Future. Special Guest speaker is Tiffany Eskelson-Maestras, Advocacy & Resource Director for the Wyoming Coalition Against Domestic Violence and Sexual Assault. No cost for lunch, catered by Moose Creek Catering. Seating is limited. 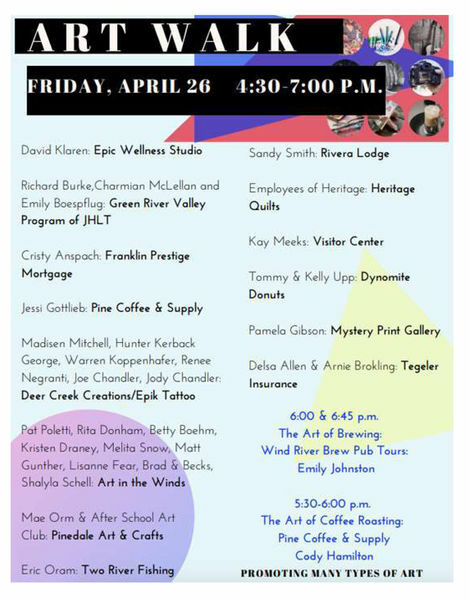 Please RSVP to SAFV by April 22nd, 307-367-6305 or 307-276-3975. 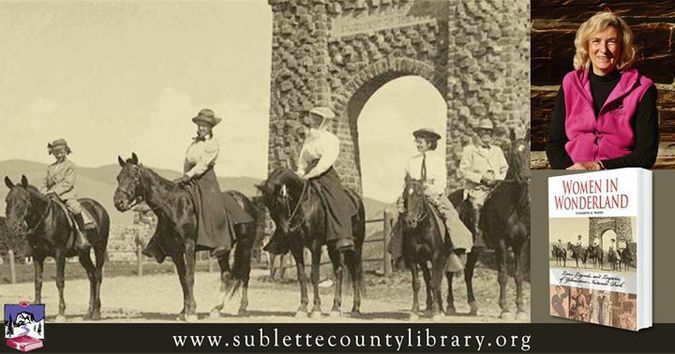 April 25: Yellowstone Women: Finding Inspiration and Identity in the West - 6:00PM at the Pinedale Library. Local author Elizabeth Watry will speak in the Pinedale Library's Lovatt Room about women as rangers, scientists, interpreters, and entrepreneurs, shaping the West’s physical and cultural landscape. A light meal and beverages will be provided. WY & US provided by AAA. The Pinedale Anticline Project Area Annual Wildlife and Operators Planning Meetings will be held on Thursday, April 25 in the Rendezvous Conference Room of the BLM Pinedale Field Office (1625 W Pine Street). The Wildlife meeting will start at 8:30AM. The Operators meeting will start at 1:00PM. The public is welcome to attend. Public comment time is scheduled for both meetings. Below are the agendas. A celebration of future scientists party will be held on Saturday, May 4th, at Rendezvous Pointe in Pinedale from 6-8 p.m. There will be food, crafts, and displays embracing scientific discovery. The event is being held in conjunction with the annual "March For Science" event being held across the United States on that day. This event is for scientists of all ages and families are especially invited to explore and discover together. Freewill donations will be used to support the local Girl Scouts troop with their Science, Technology, Engineering, Math (STEM) programs. The Women’s Advocacy Group (WAG) is sponsoring this activity. For any questions, contact Joni Mack at 307-690-0669. The Jonah Interagency Office (JIO) and Pinedale Anticline Project Office (PAPO) Boards of Directors will meet at the BLM Pinedale Field Office, May 9, 2019. The PAPO Board meeting is scheduled for 8:30-10 a.m. The JIO Board will meet immediately after the PAPO meeting and is expected to conclude by 11:30 a.m. Both meetings are open to the public. Each board will review proposed budgets for 2019 and receive updates on active projects. The PAPO Board will make decisions on funding each of two new 2019 PAPO mitigation project proposals submitted in February. The JIO Board will consider JIO Team proposals for new projects. Agendas for the JIO and PAPO Board meetings can be found at www.wy.blm.gov/jio-papo/whatsgoingon.htm. The Pinedale Field Office is located at 1625 West Pine Street. For more information, please contact Kellie Roadifer at 307-367-5309 or kroadife@blm.gov. Public Notice: Sublette BOCES will have a Special Meeting on Tuesday, April 23, 2019 at 6:30 pm in the Conference Room, 665 N Tyler Ave. in Pinedale, Wyoming. The purpose of the meeting is to elect a new treasurer. Sublette County Sexual Assault and Family Violence (SAFV) Task Force will have their annual luncheon on Thursday, April 25th. Special guest speaker will be Tiffany Eskelson-Maestas from the Wyoming Coalition Against Domestic Violence Sexual Assault and Stalking. Her talk will be about the history of violence against women movement. The event is part of the Wyoming Women Then and Now events. RSVP to SAFV (307) 367-6305. Author Elizabeth Watry will give a talk on "Yellowstone Women: Finding Inspiration and Identity in the West" at 6:00PM on Thursday, April 25th in the Lovatt Room of the Pinedale Library. The presentation is part of the Wyoming Women: Then & Now evens. She will talk about women as rangers, scientists, interpreters, and entrepreneurs, shaping the West’s physical and cultural landscape. A light meal and beverages will be provided. Ms. Watry is the former Curator at the Museum of the Mountain Man in Pinedale and author of the book "Women in Wonderland: Lives, Legends and Legacies of Yellowstone National Park. Everyone is invited to stroll around Pinedale and view local artists' work, with a focus on multiple types of art; food, pottery, painting, coffee, jewelry, etc. The Art Walk will be from 4:30 to 7:00PM. There will also be several demonstrations during the Art Walk. 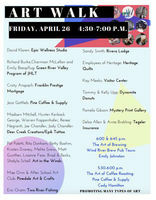 The Pinedale Community Food Basket Second Annual Auction will be held on Saturday, April 27th. Have fun helping the Pinedale Food Basket raise funds to update the stairs in the store. There will be a great variety of items. It will be from 4-6PM. Check out the Food Basket Facebook page for a sneak peek of auction items. There will be a Passport Fair on Saturday, May 4th from 11AM to 2PM in the Lovatt Room of the Pinedale Library. Apply for or renew your passport. You must bring an original or certified birth certificate with raised seal, and a photo ID. To apply for a youth passport (under 16), you must also have both parents present or a notarized DS-3053 form. Cash or checks only. For questions, call the Big Piney Post Office 307-276-3772. 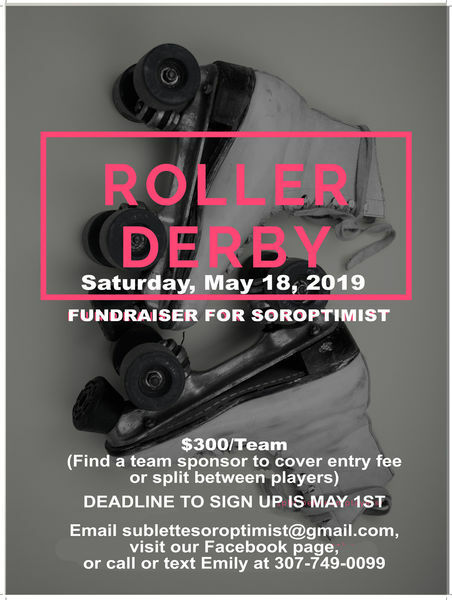 Soroptomist in Sublette County will host Roller Derby on Saturday, May 18th. 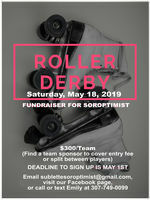 The event is a fundraiser for Soroptomist. Cost is $300/team. Find a sponsor to cover the entry fee or split it between players. Deadline to sign up is May 1st. For more information email sublettesoroptomist@gmail.com, or visit the Facebook page, or contact Emily at 307-749-0099. There will be a Special Meeting of the Pinedale Town Council, Tuesday, May 7th, 2019 at 4 PM at the Lovatt Room of the Sublette County Library. Agenda items are the award of the contract to construct the dump and fill station and the interview of candidates to fill the town council vacancy. An appointment may be made to fill the vacant council seat. The regular town council meeting will begin at 6 PM, April 22, 2019, in the Commissioners Room of the Sublette County Courthouse. The interviews to fill the council vacancy previously scheduled for April 22, 2019 at 4 PM have been re-scheduled and will take place at the Special Meeting May 7th at 4 PM. 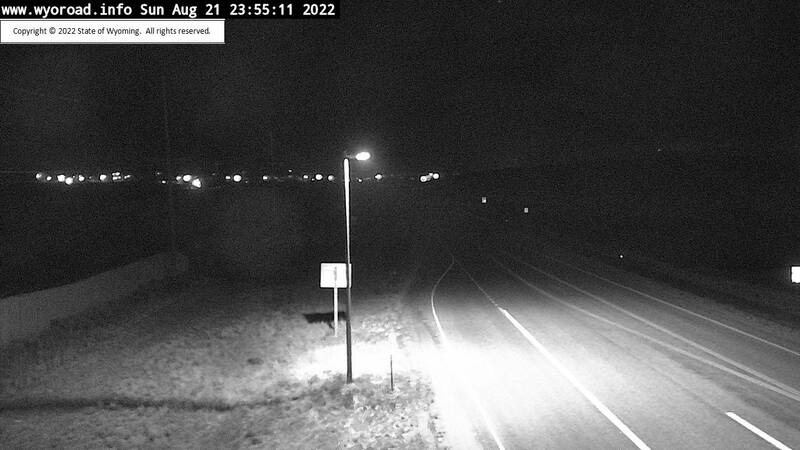 Current views from area web cameras. Travel and Weather info here. We are located in Office Outlet in Pinedale, 43 S. Sublette Ave.
visit our Sublette.com and BigPiney.com websites. Pinedale Local and Pinedale Online are designed and maintained by Wind River Web Services LLC in Pinedale, Wyoming. News stories are contributed by members of the community. Our office is located in Office Outlet in Pinedale, 43 S Sublette Ave. We welcome story contributions by anyone from the community about upcoming events. Credits: Photos by Pinedale Online unless otherwise credited. We welcome photo contributions, especially for the Pinedale Local top picture and "Out and About" photo gallery. To submit photos, please send as high resolution photo as available (preferably larger than 1000 pixels on horizontal dimension.) Top header photos should have a narrow horizontal element that can be extracted to fit the banner space. Pinedale Online/Wind River Web Services LLC also owns and maintains the Sublette.com and BigPiney.com companion sites. All site content is copyright 2019. Photos, graphics and written content may not be used without advance permission from Pinedale Online/Wind River Web Services LLC. Please contact us for more information or questions about using content found on our site, support@pinedaleonline.com, 307-360-7689. If you find any broken links on our site, please let us know. Thank you for visiting us!